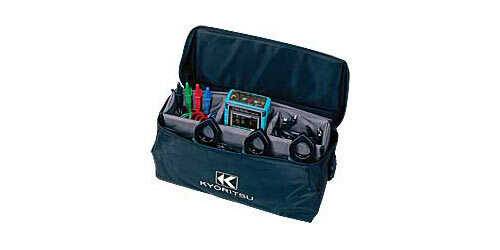 The harmonics-analyser Kyoritsu 6310 is used for the analysis of performance and harmonics. The harmonics-analyser can safely measure currents of up to 3000 A. Besides the performance analysis, the harmonics-analyser can execute a complete network analysis. The harmonics-analyser also measures the phase angle, harmonics, apparent power, active power and work. All measurable variables are shown on the colour display of the harmonics-analyser 6310. The harmonics-analyser’s built-in memory has a size of 1.8 MB therefore is sufficient for a data record of about 2 days. The memory of the harmonics-analyser can be extended by an additional CF card. The Maximum memory capacity is 2 GB. 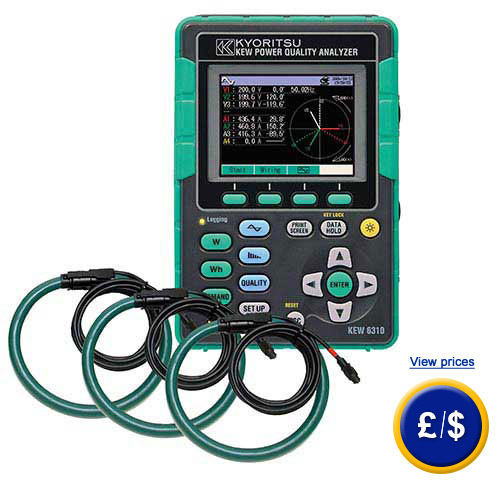 The harmonics-analyser is the large version of harmonics-analyser Kyoritsu 6300. If you have any questions concerning the harmonics-analyser, please take a look at the following technical data or call our hotline: UK customers +44(0) 23 809 870 30 / US customers +1-410-387-7703. Our technicians and engineers will gladly advise you on the harmonics-analyser or any other of PCE Germany GmbH’s products in the fields of regulation and control, or scales and balances of PCE Instruments. ± 0.3 % rdg ± 0.2 % f.s. ± 0.3% rdg ± 0.2% f.s. ± 0.5% rdg ± 0.2% f.s.